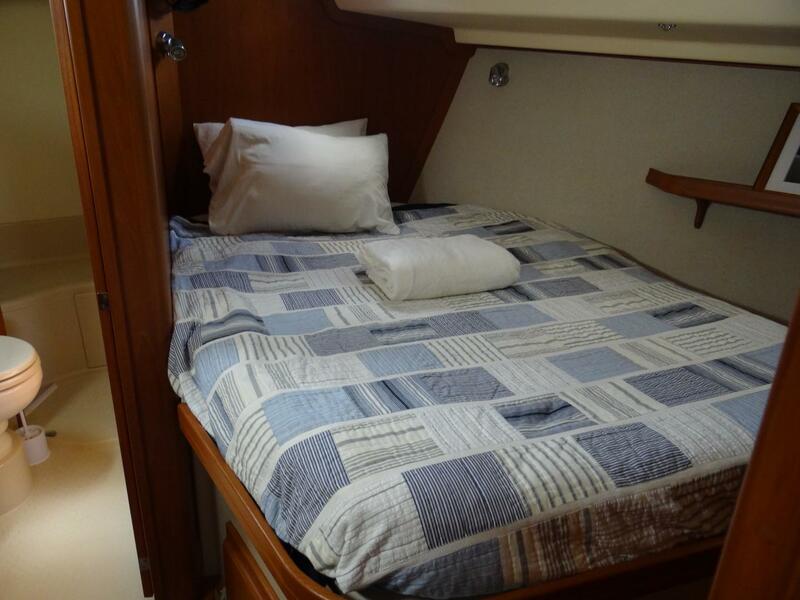 The Island Packet 440 possesses all the exemplary qualities that earned Island Packet a worldwide reputation as a leader in cruising boat design and construction. 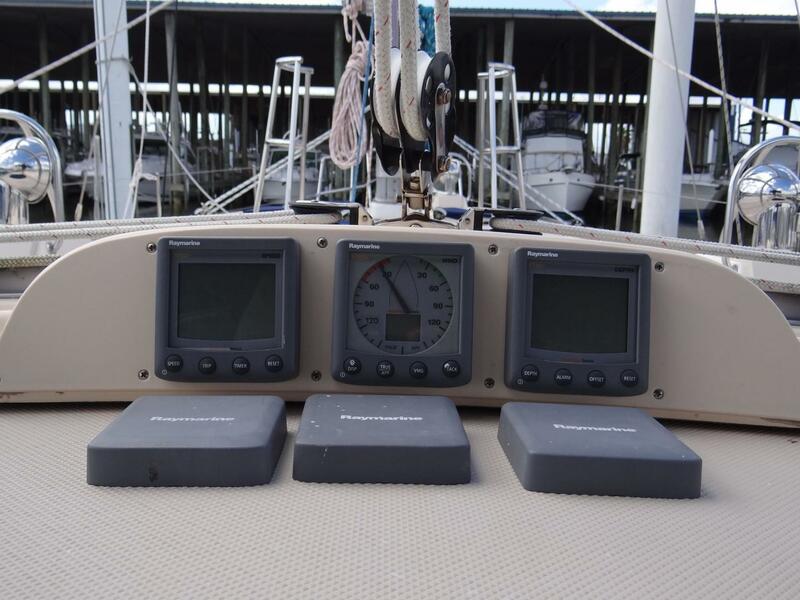 Superior comfort, ease of use, seakeeping and safety attributes that are the hallmark of every Island Packet, along with innovative features and stunning good looks. 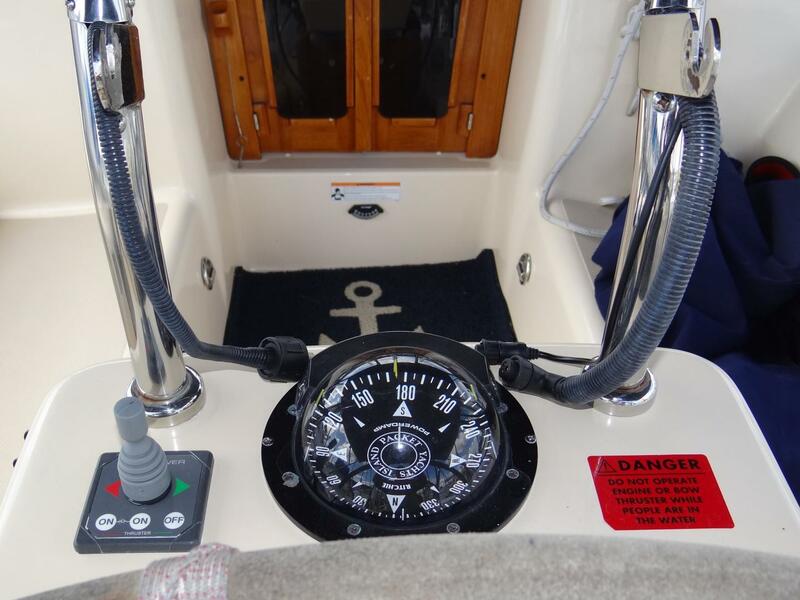 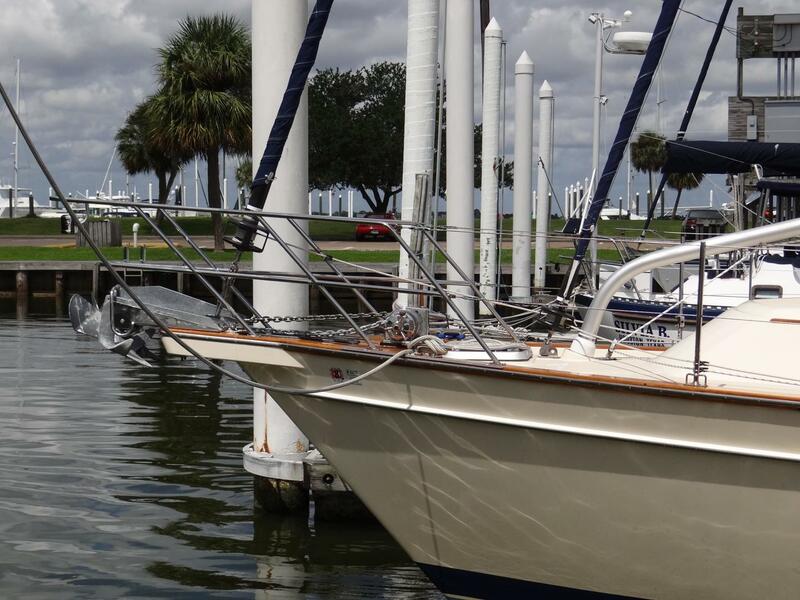 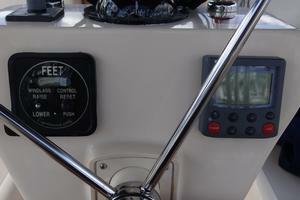 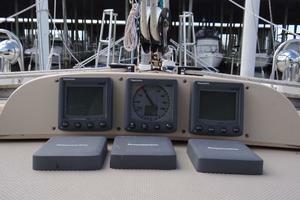 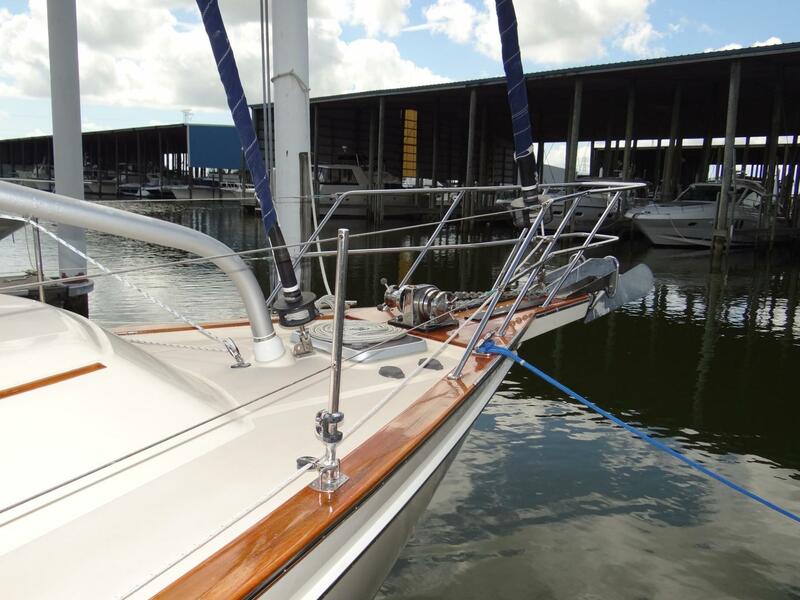 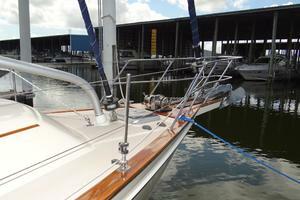 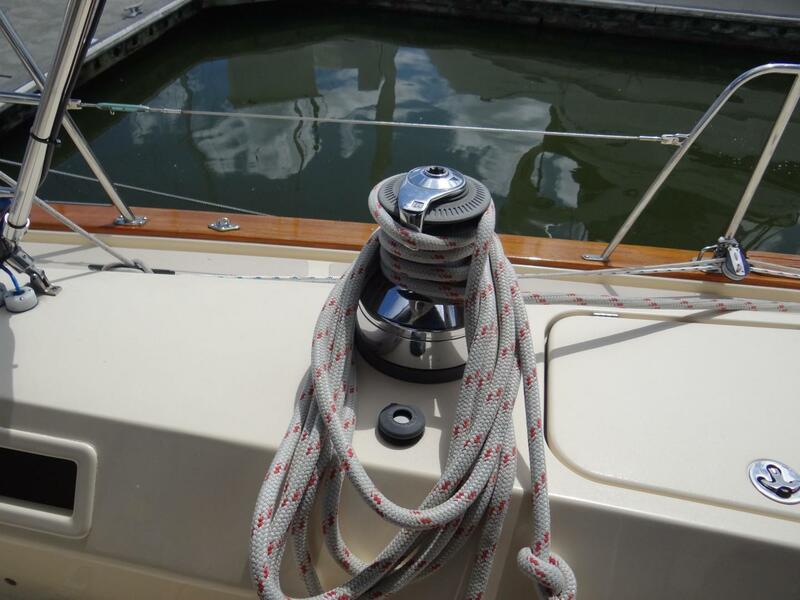 This beautiful aft cockpit cutter with almost 46’ of overall length is a capable of long distance blue water cruising. 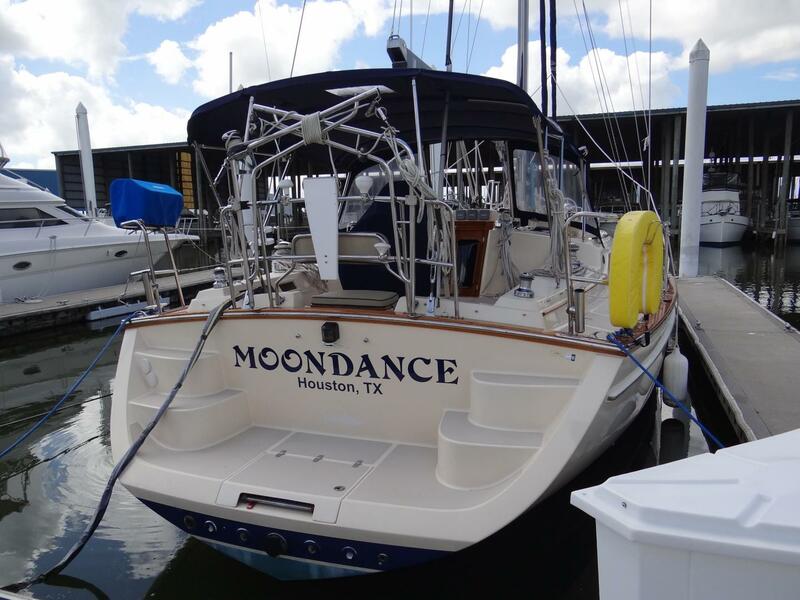 The two full staterooms, both with heads with separate showers, a spacious and beautiful galley and main salon area along with a great navigation table ensures that you and your guests will be comfortable living aboard Moondance for long periods of time. 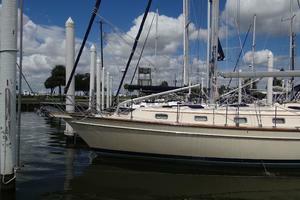 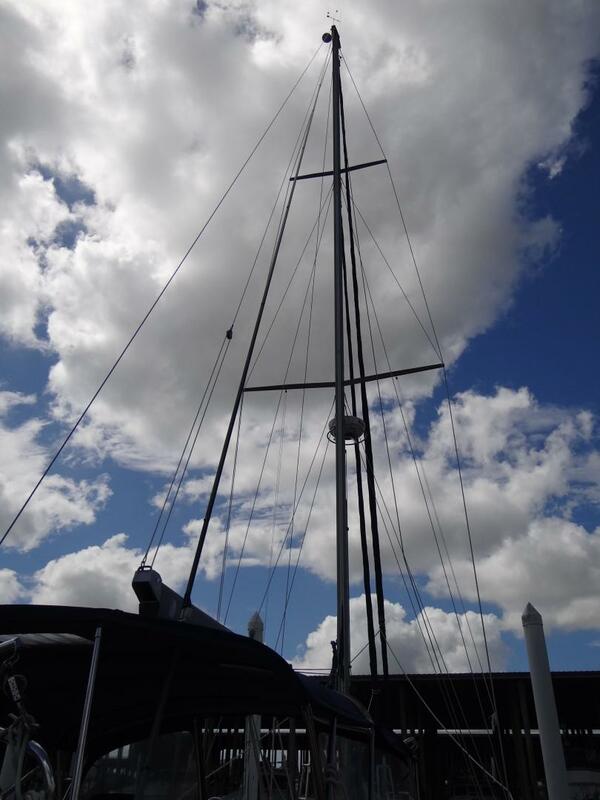 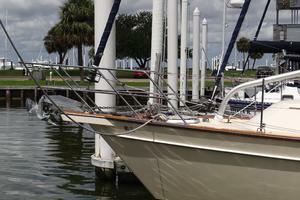 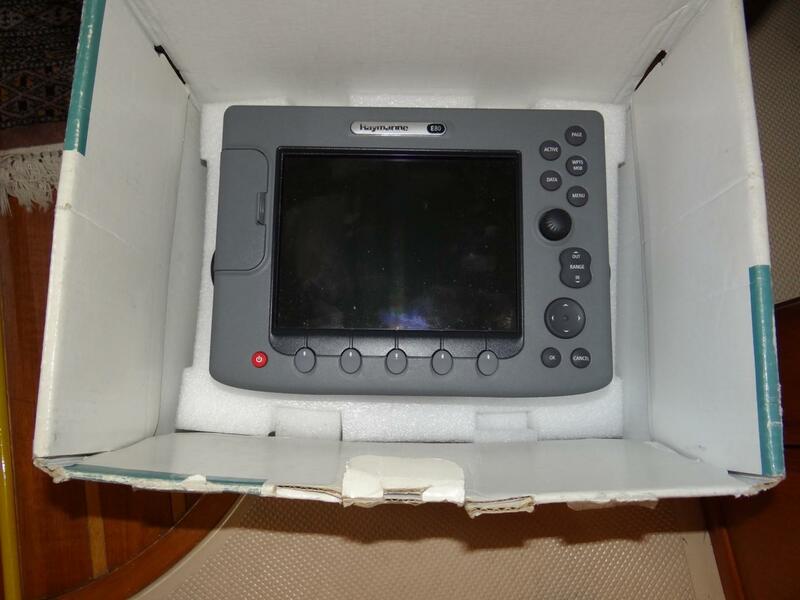 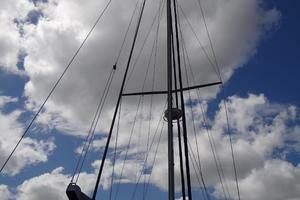 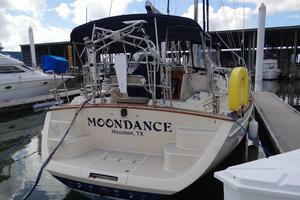 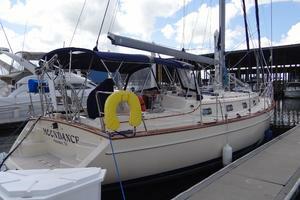 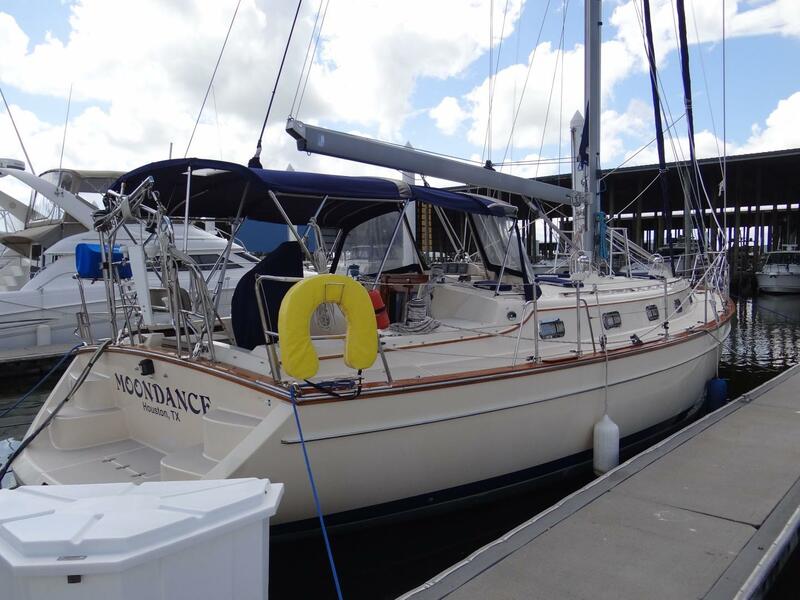 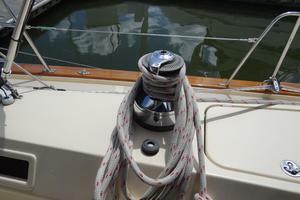 Moondance was manufactured in 2007; however, the first and ONLY owner did not purchase her until June of 2009. 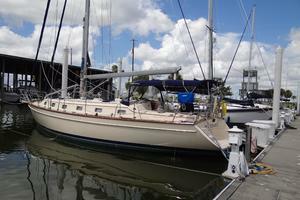 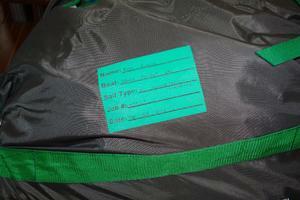 Once purchased, the owner was not able to take possession of her until April of 2010 due to being out of the country. 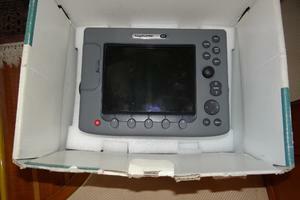 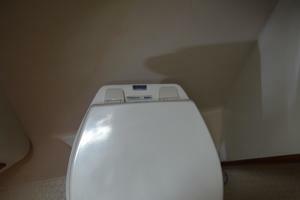 As a result, although this is a 2007 model, she received little to no "wear and tear" for the first three years of her existence. 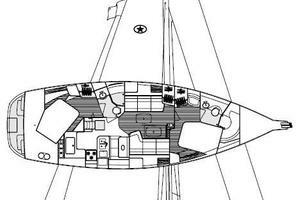 Entering the interior on comfortably angled companionway steps, one will be immediately impressed by the expansive main salon. 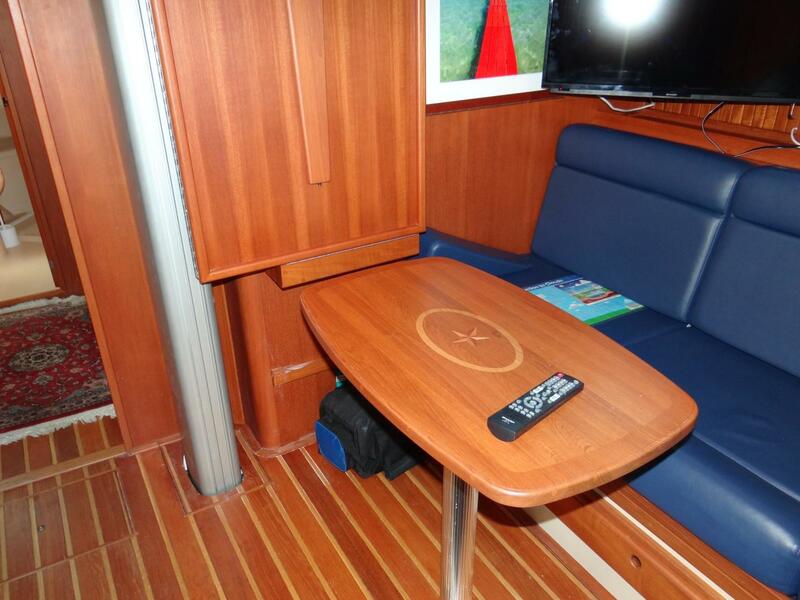 Full length settees in Navy UltraLeather to port and starboard invite socializing and gracious entertaining. 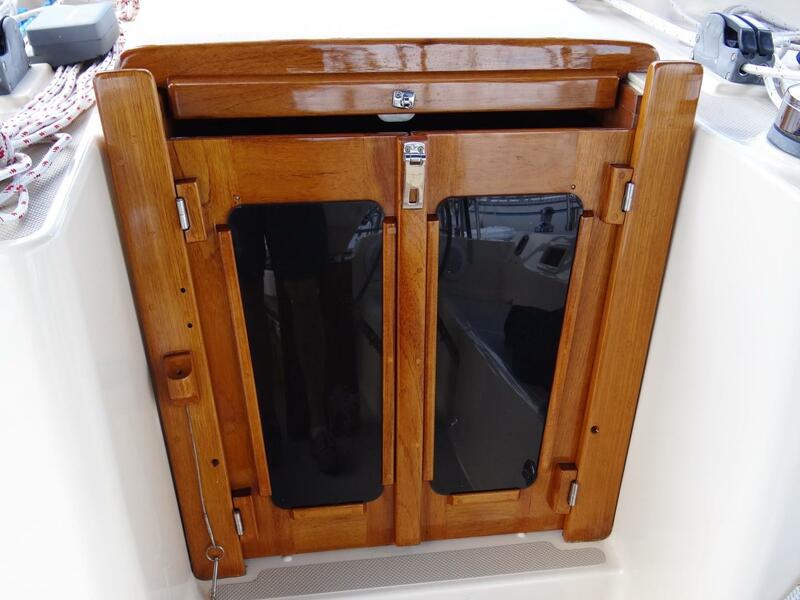 There is a large drop leaf table that folds against the forward bulkhead, which allows for a very open interior when not in use. 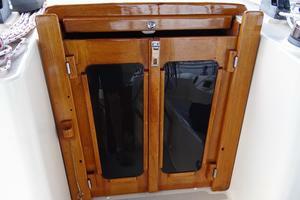 When in the up position, the table conceals a hidden bottle and glass storage rack. 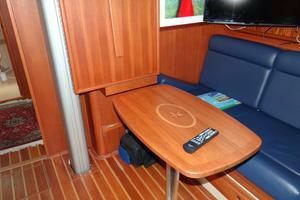 When down, the table offers a spacious and comfortable dining area. 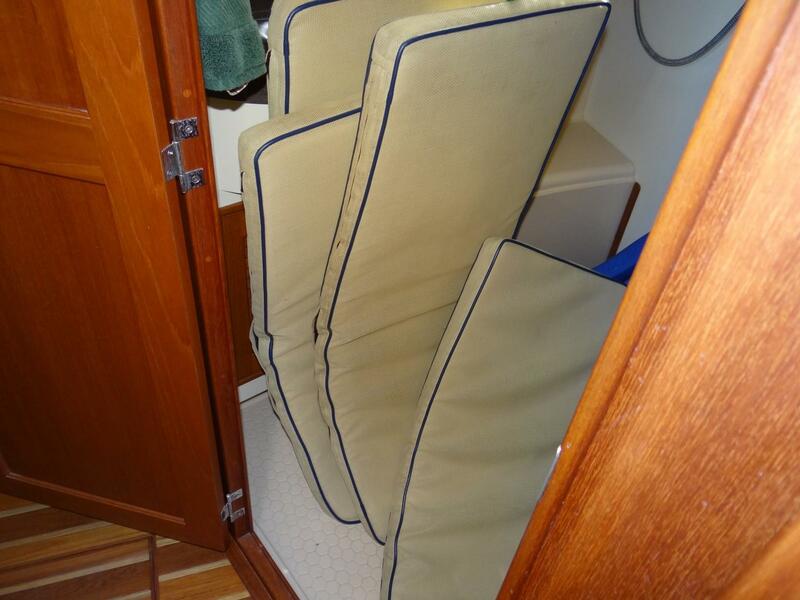 The starboard settee extends toward the centerline to make into a double berth and both settees can double as seaberths. 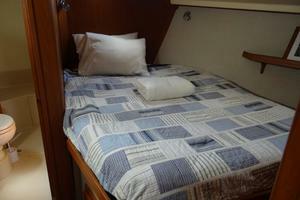 Forward of the salon is the spacious master stateroom with privacy doors and forward head compartment. 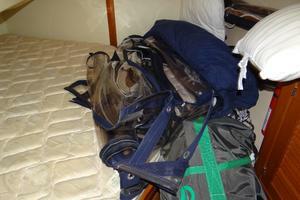 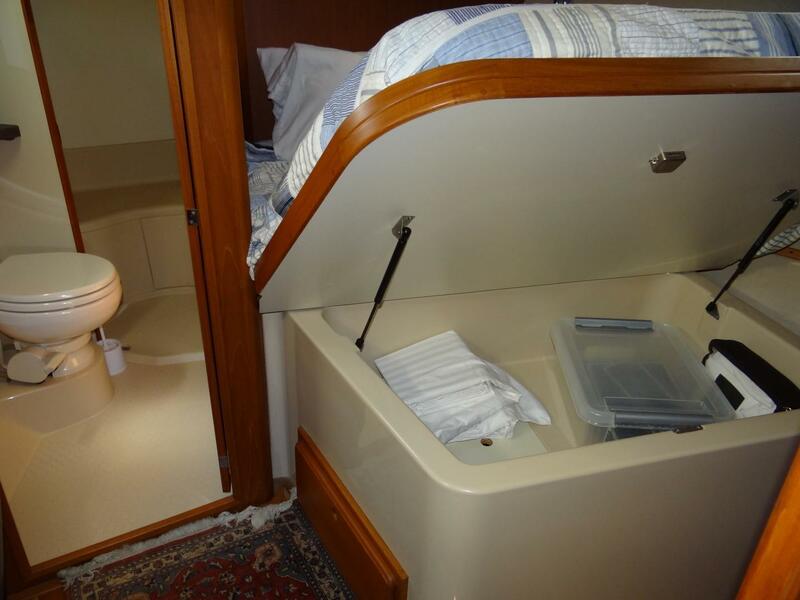 There is a large, offset double berth, dressing chair and exceptional storage in this cabin. 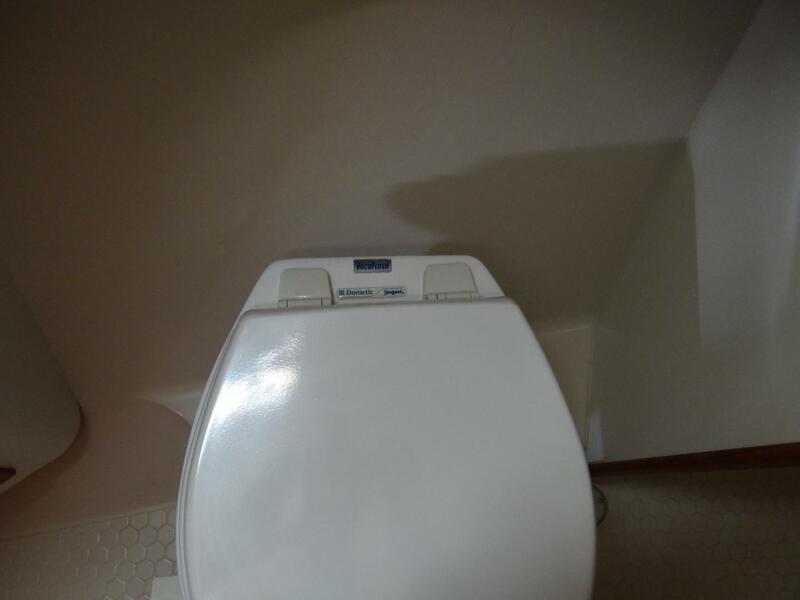 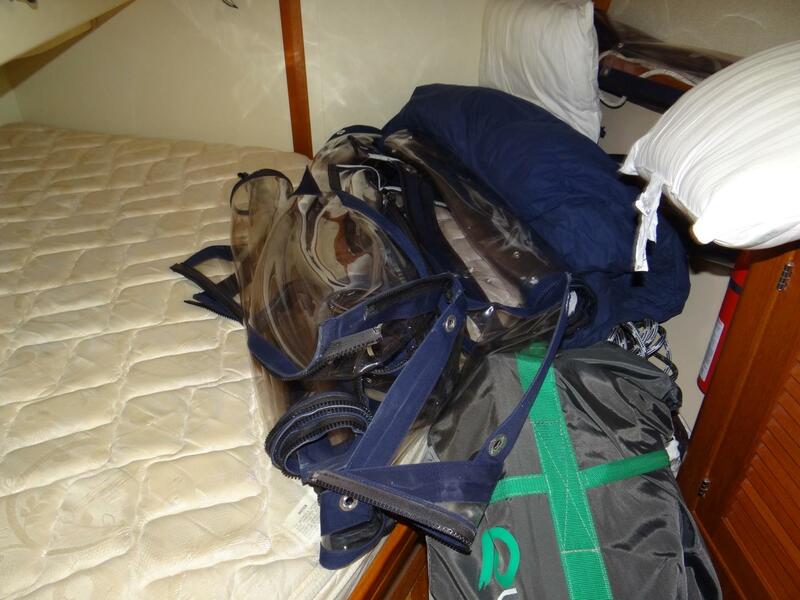 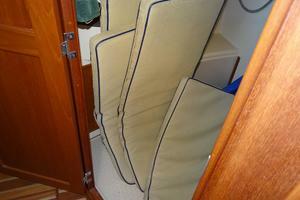 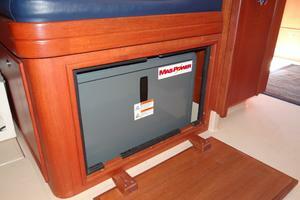 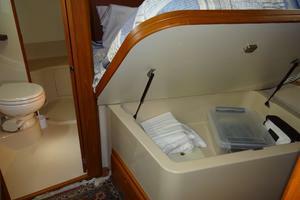 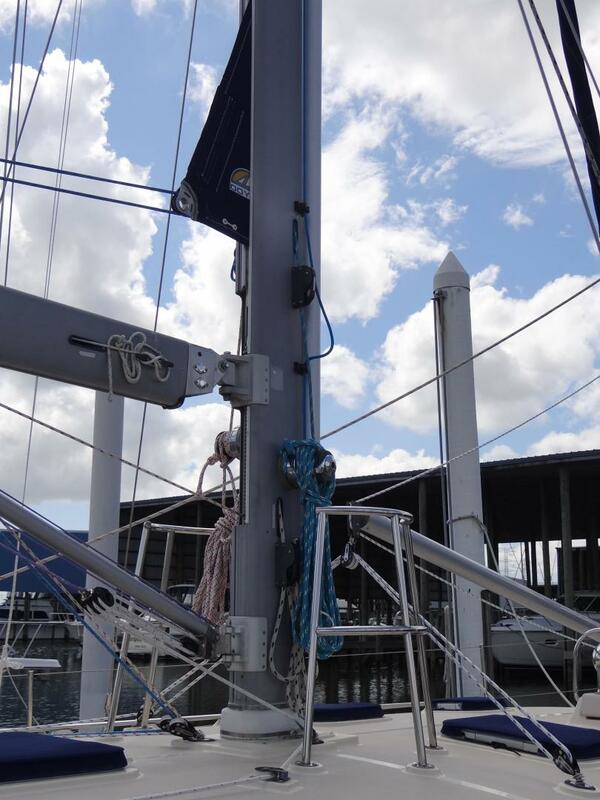 The aft end of the berth lifts on gas struts to reveal a large area to store linens. 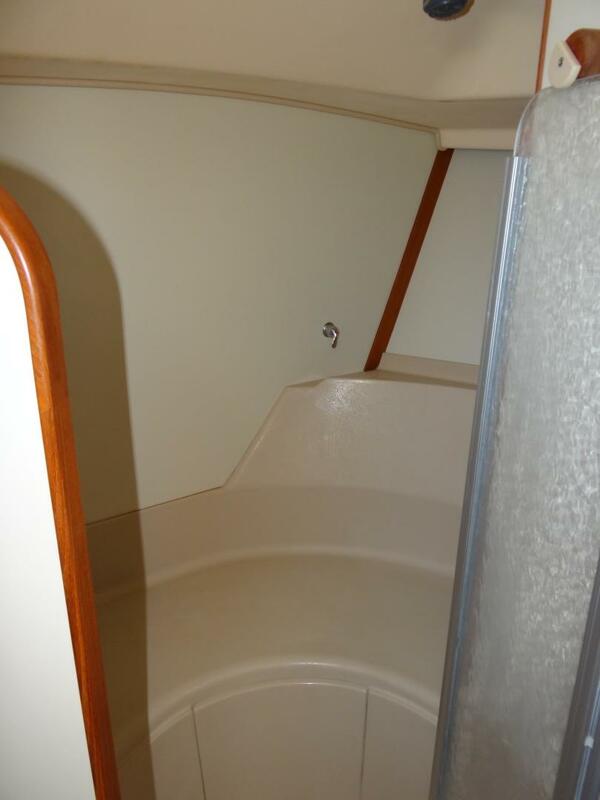 The ensuite head has a separate shower stall with a wide curved seat, vanity with great counter space, storage cabinets and a VacuFlush electric head. 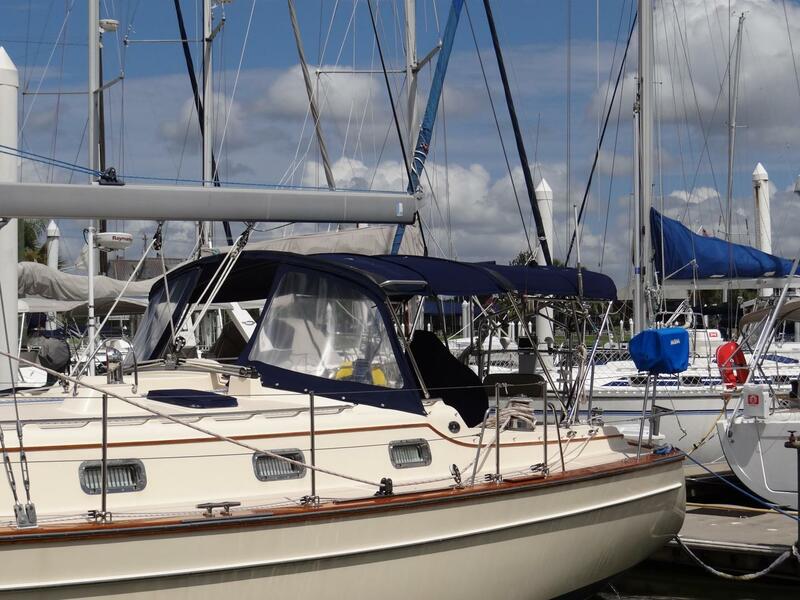 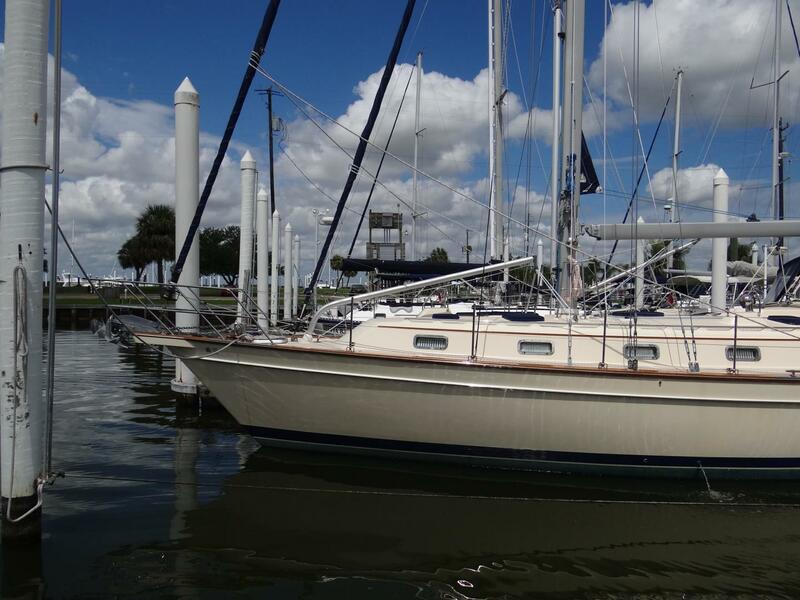 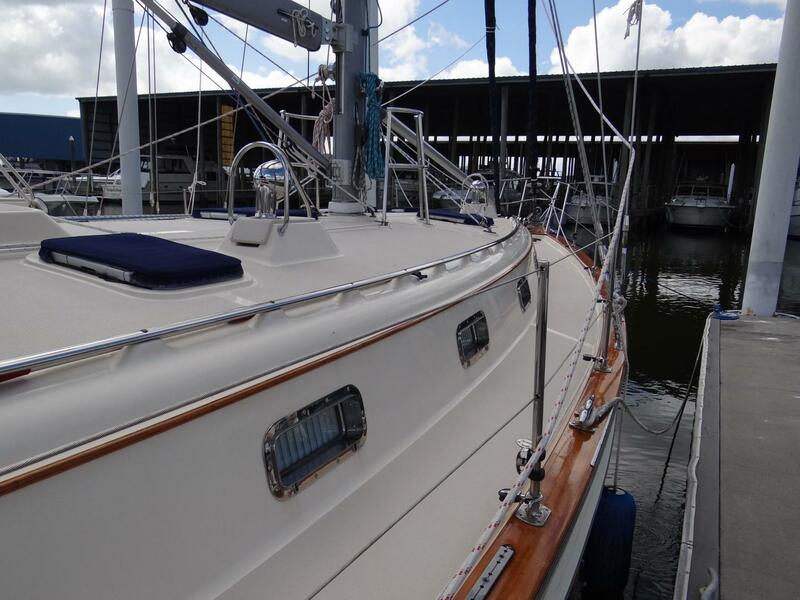 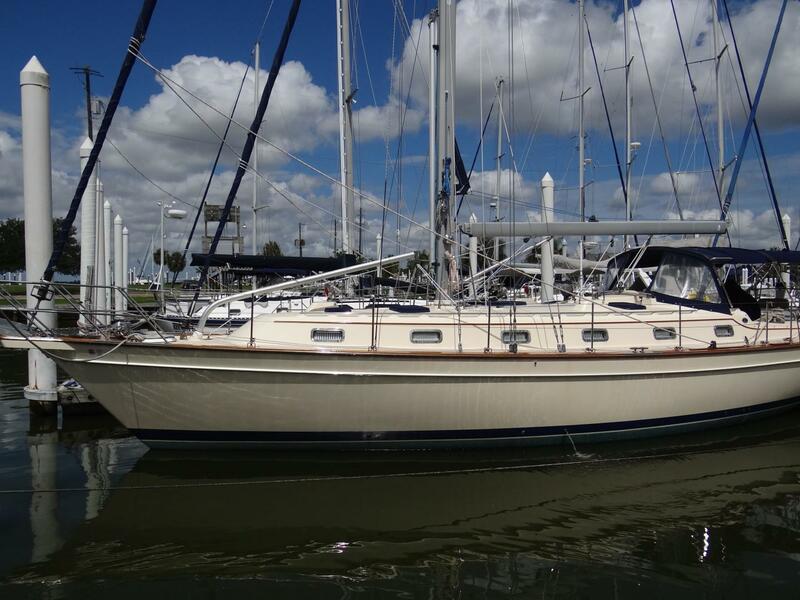 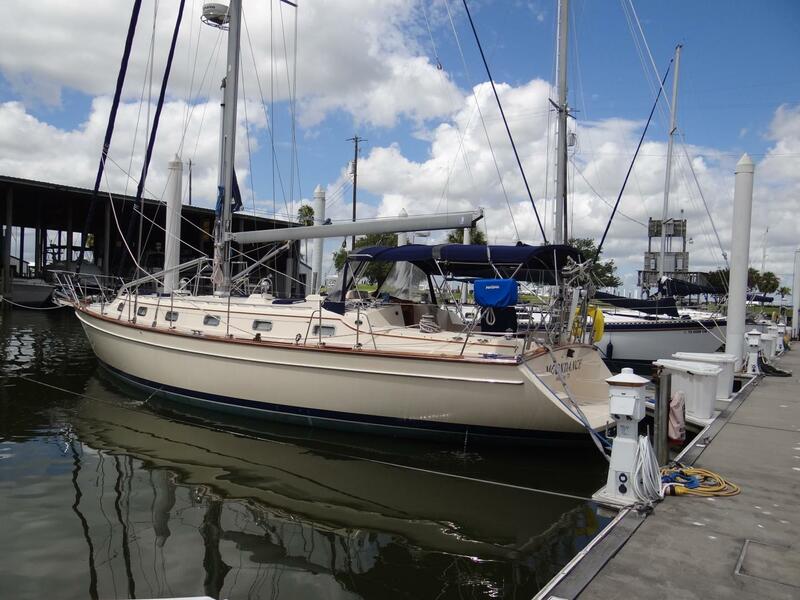 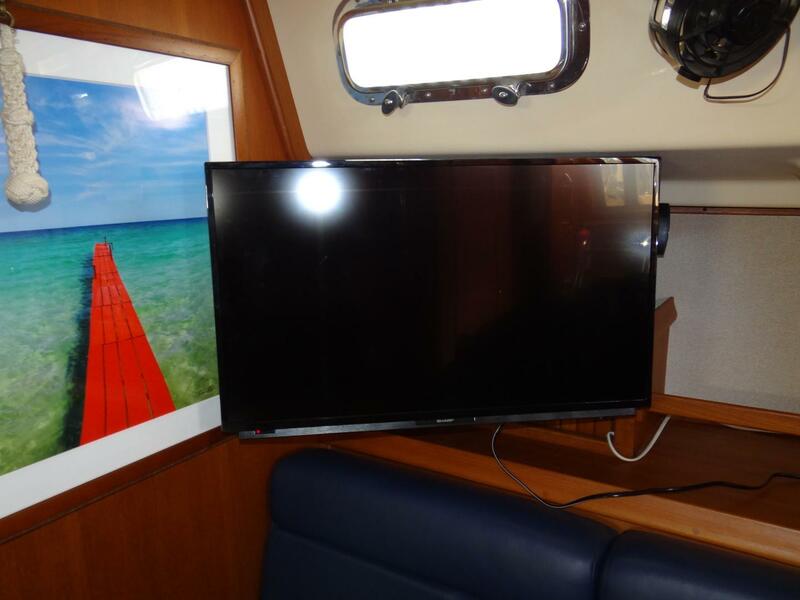 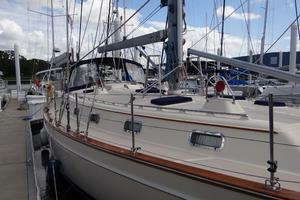 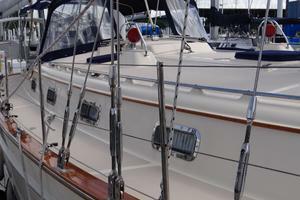 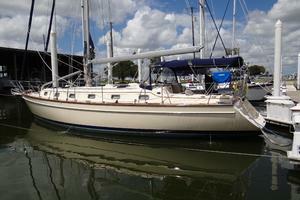 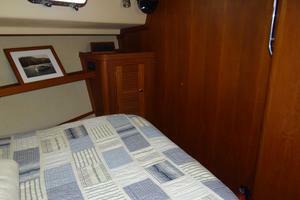 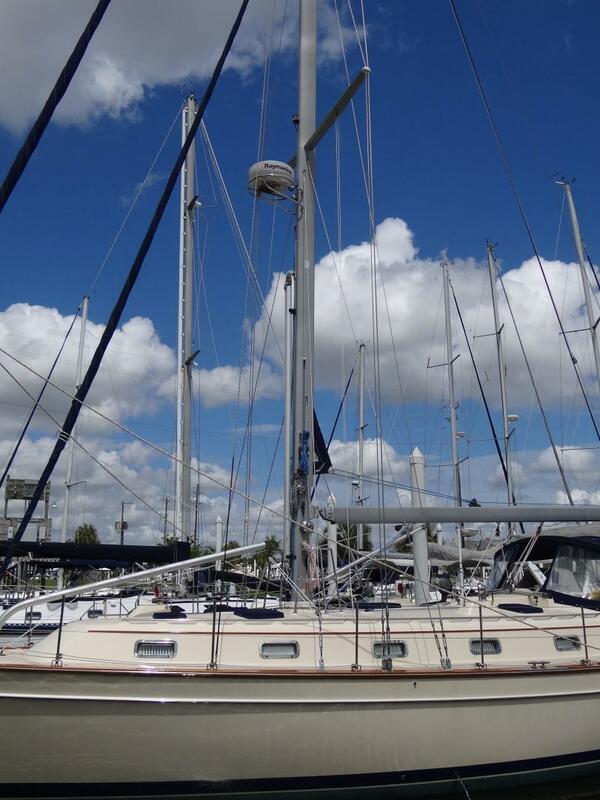 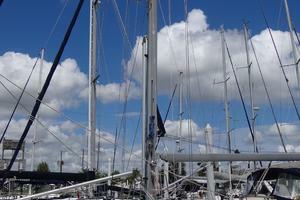 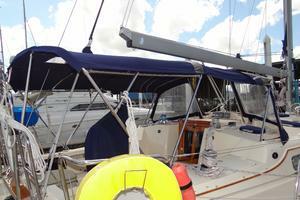 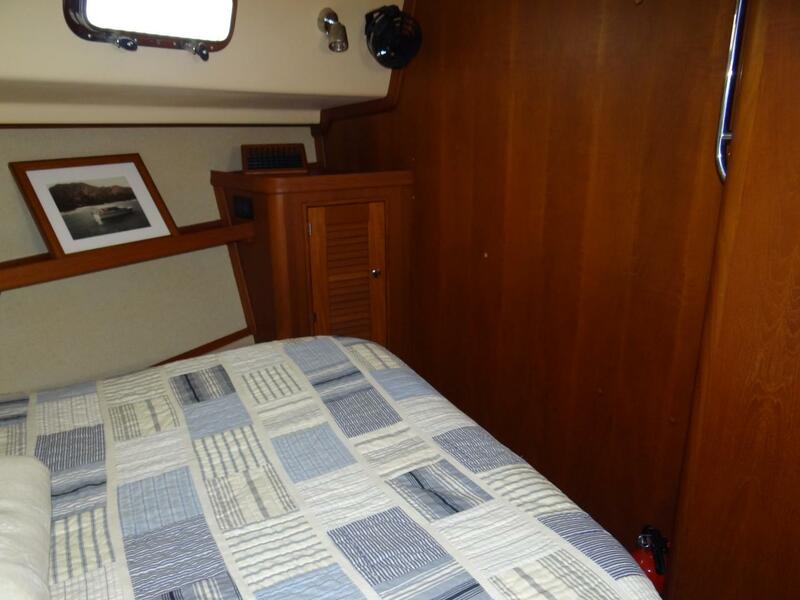 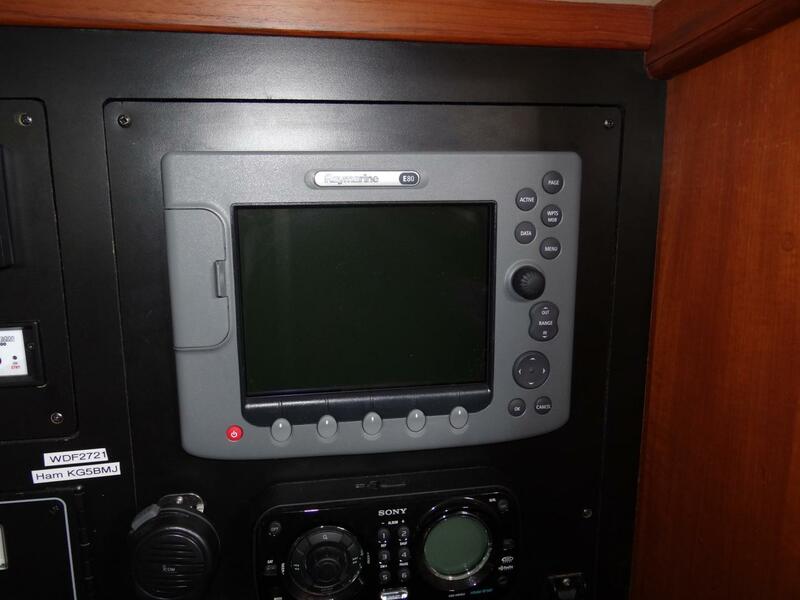 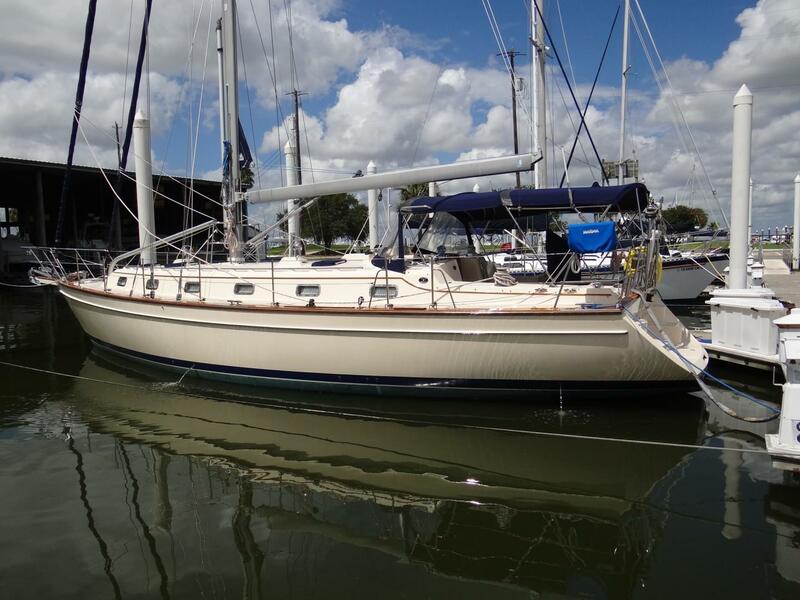 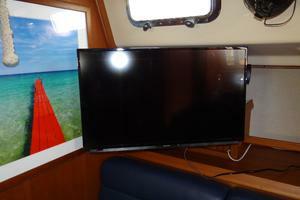 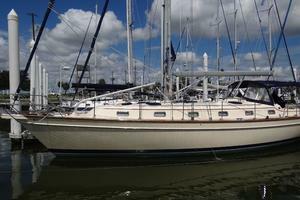 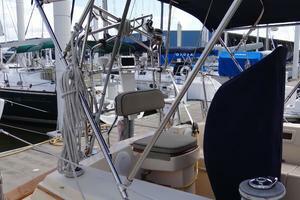 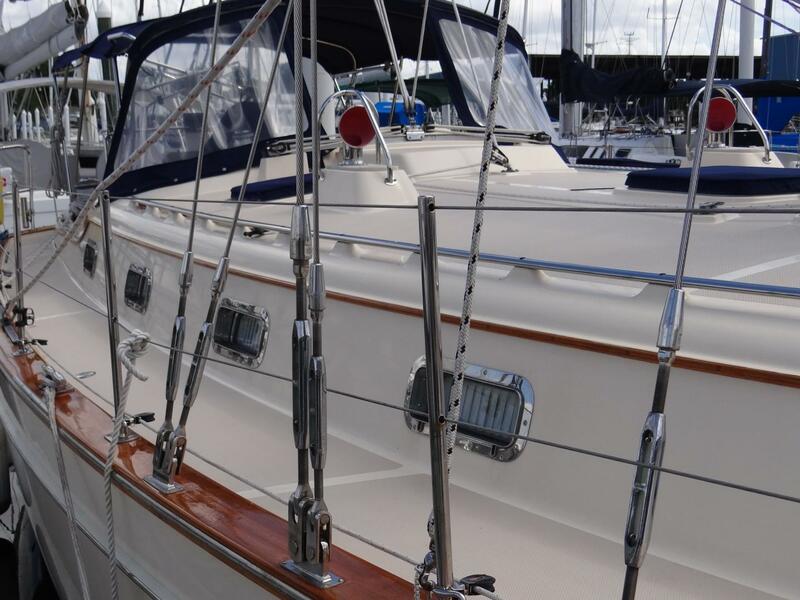 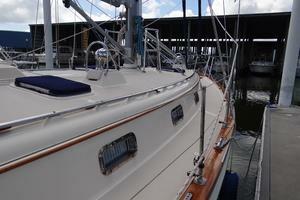 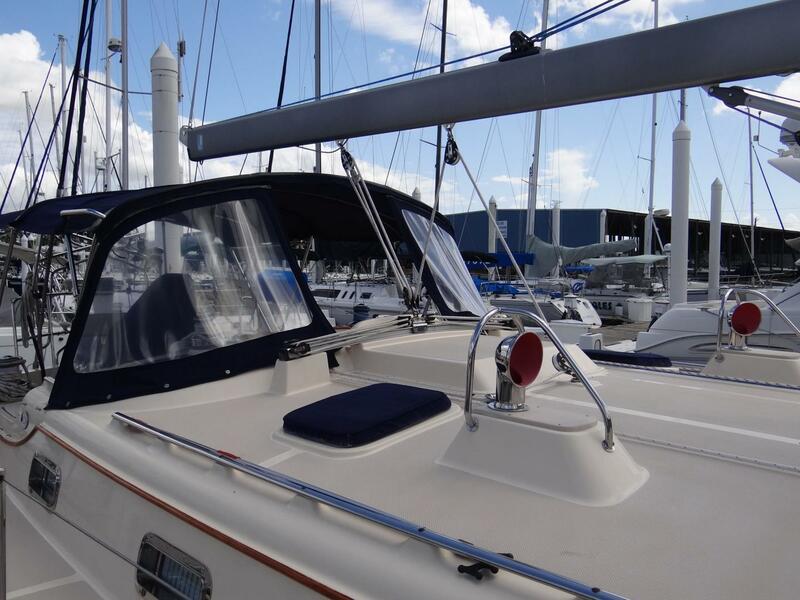 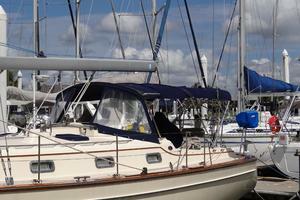 The spacious galley is conveniently located just starboard of the companionway steps. 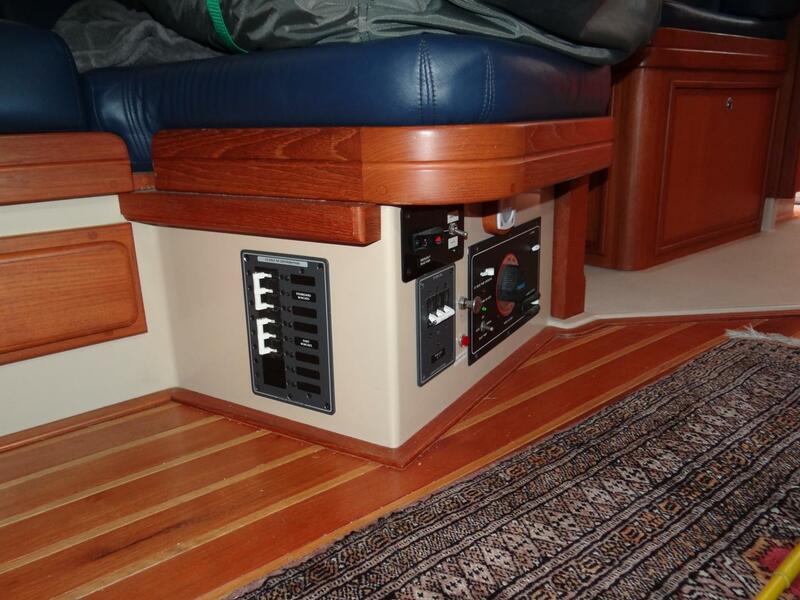 Just in front of the galley, there is a forward-facing navigation station with wide bench seat, table, abundant space for electronics and a dedicated compartment for the generator underneath the seat. 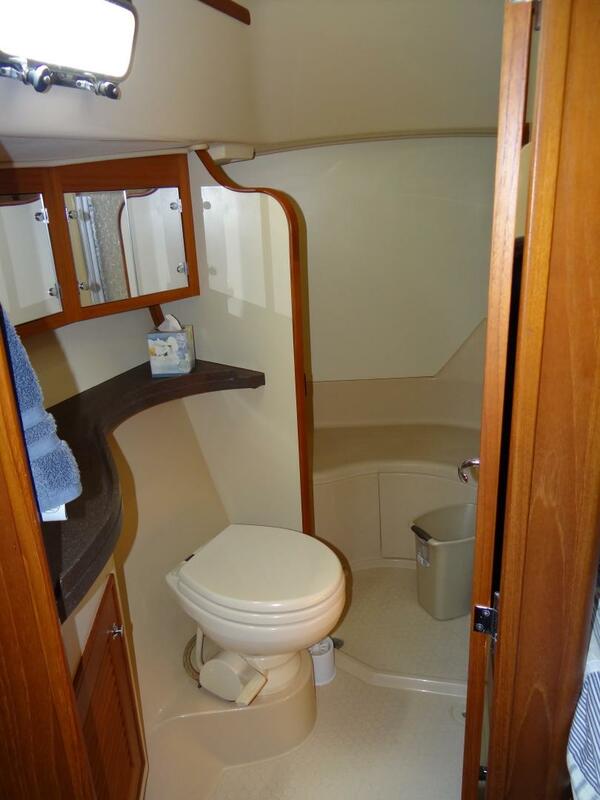 Opposite the nav station and to port of the companionway steps is the large guest head with solid acrylic countertop, molded sink, VacuFlush electric head, storage cabinets, opening port, overhead hatch and separate shower stall. 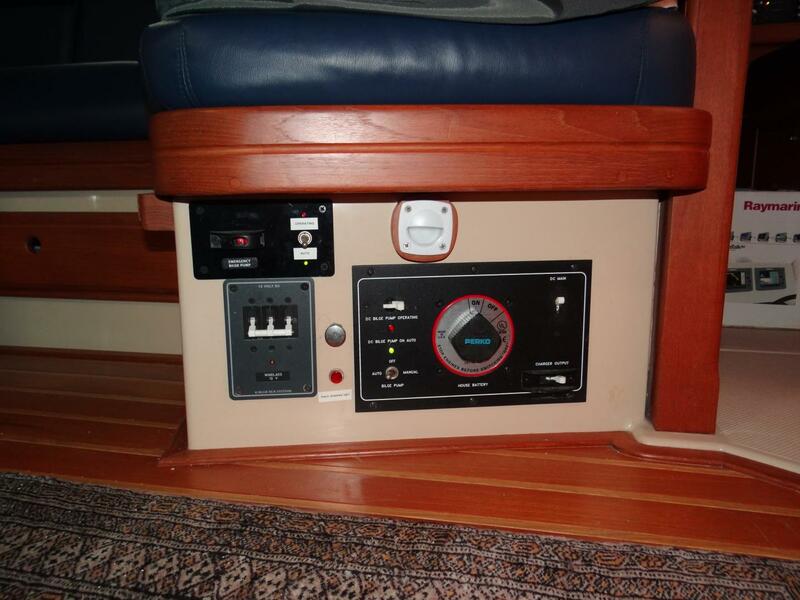 This head has a door conveniently located near the companionway in the main salon plus an additional door for private access from the aft stateroom. 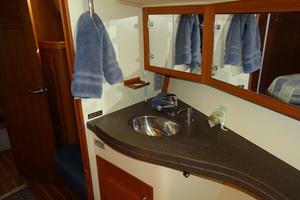 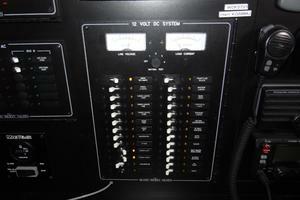 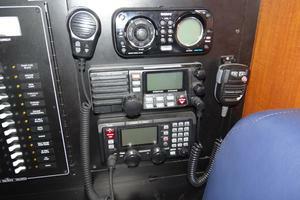 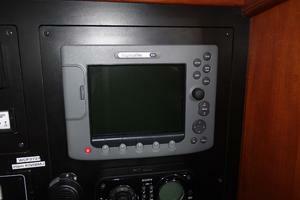 The large aft stateroom offers many of the same amenities as the master. 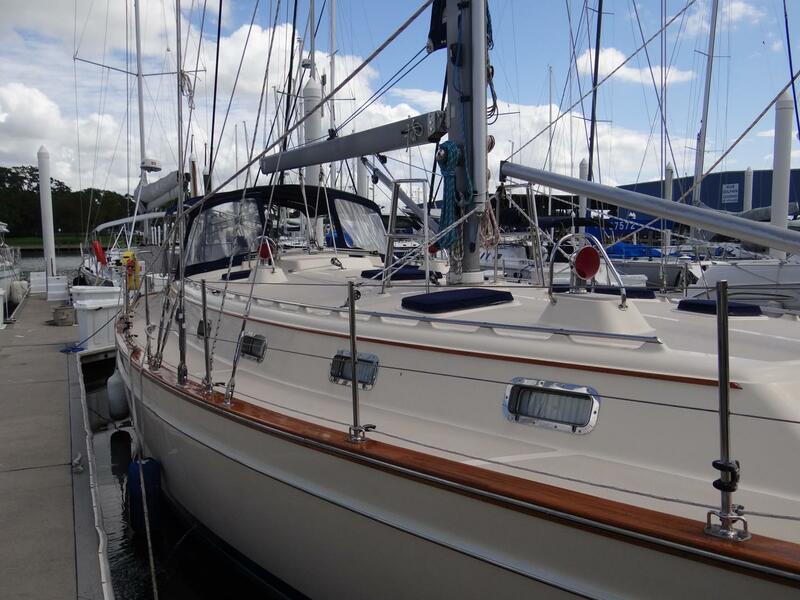 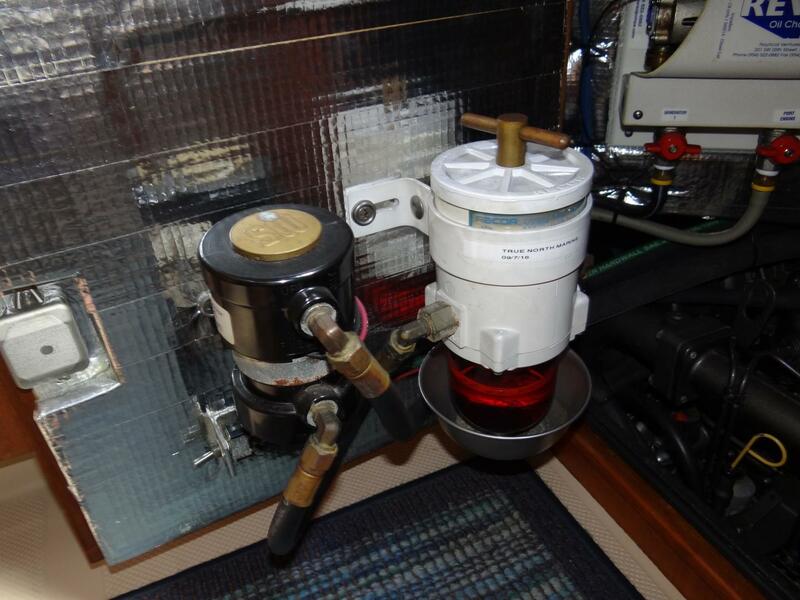 There is a large offset double island berth, teak shelves outboard, cedar-lined hanging locker and storage under berth accessed via gas support struts. 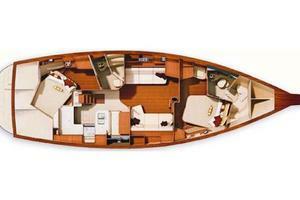 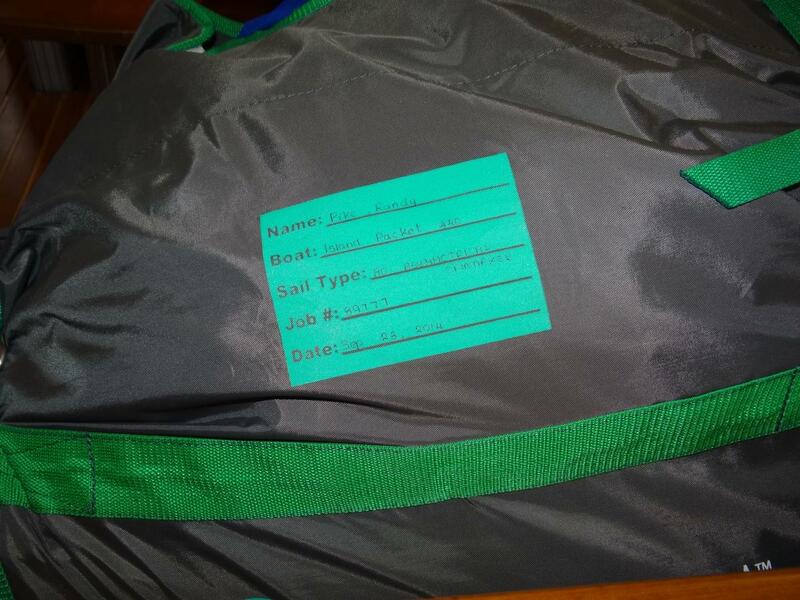 Overall, the interior layout of this boat is fantastic! 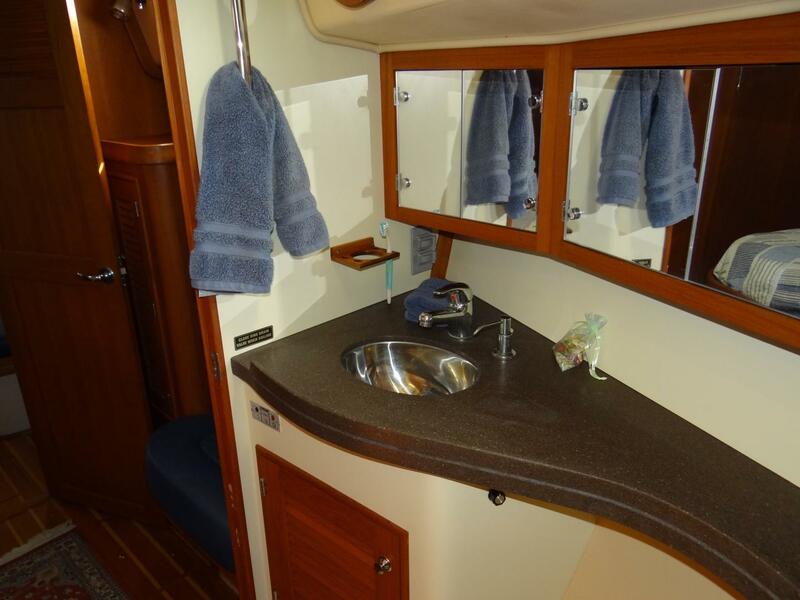 This spacious U-shaped galley offers a generous wrap-around Corian counter over teak cabinetry and a slip resistant sole. 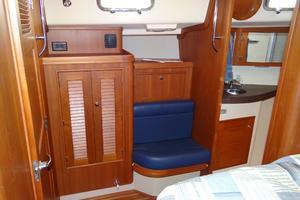 The open layout gives the cook room to move comfortably yet is safe when underway. 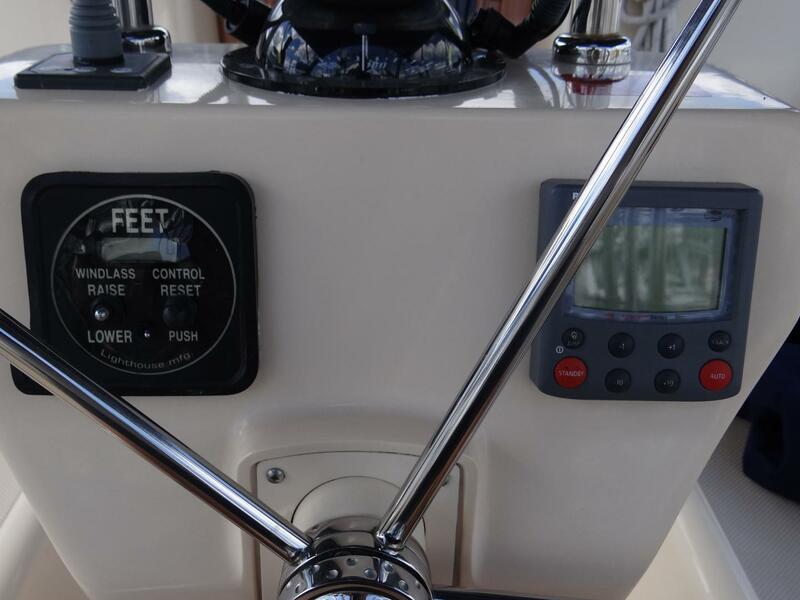 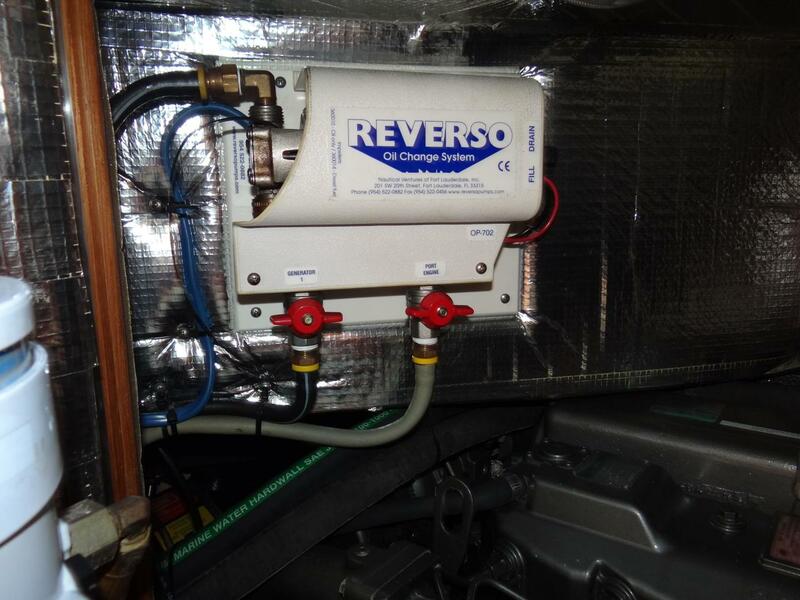 The Frigoboat refrigerator/freezer is well insulated, has digital controls and double gasketed lids on gas support struts for easy access. 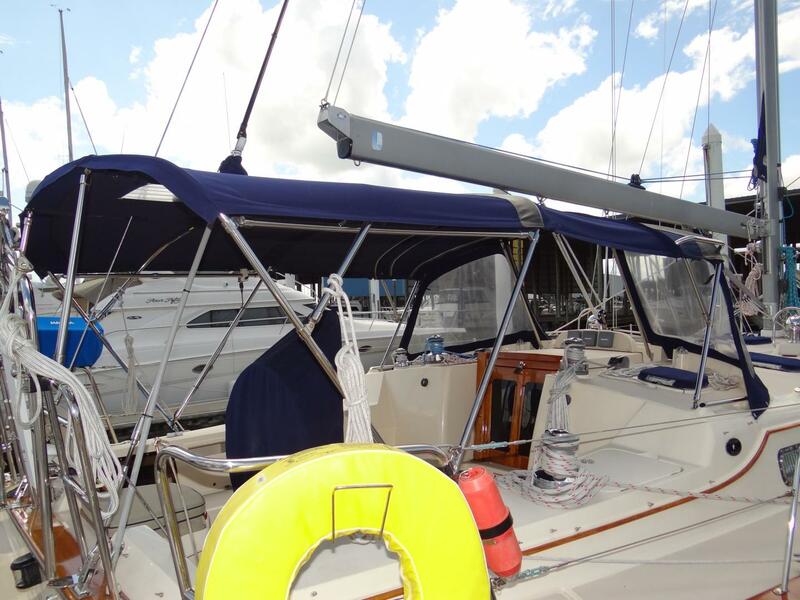 Other features include a Force 10 LPG range with oven & broiler, microwave, double S/S sinks with water purification system, manual freshwater pump and storage galore. 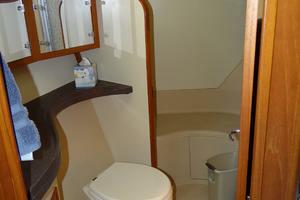 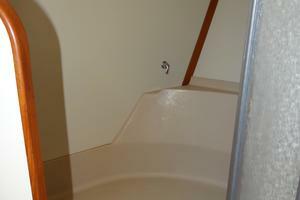 The attractive and practical design of this exemplary galley will make it a pleasure to use. 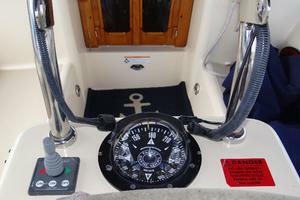 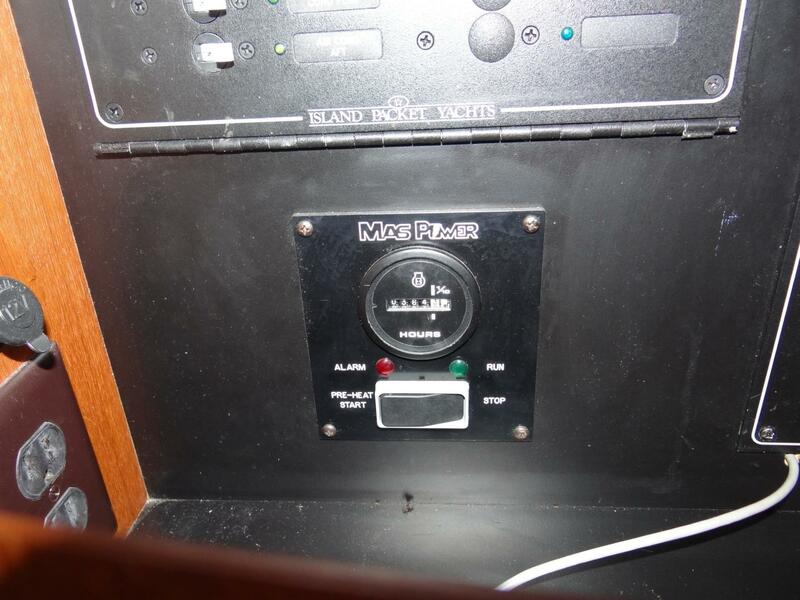 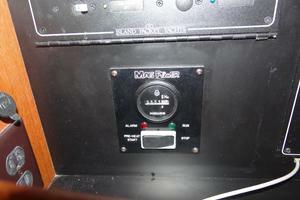 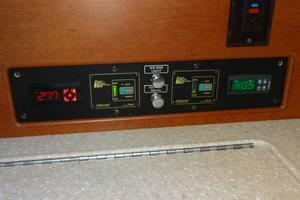 The aft cockpit design is very popular among Island Packet owners. 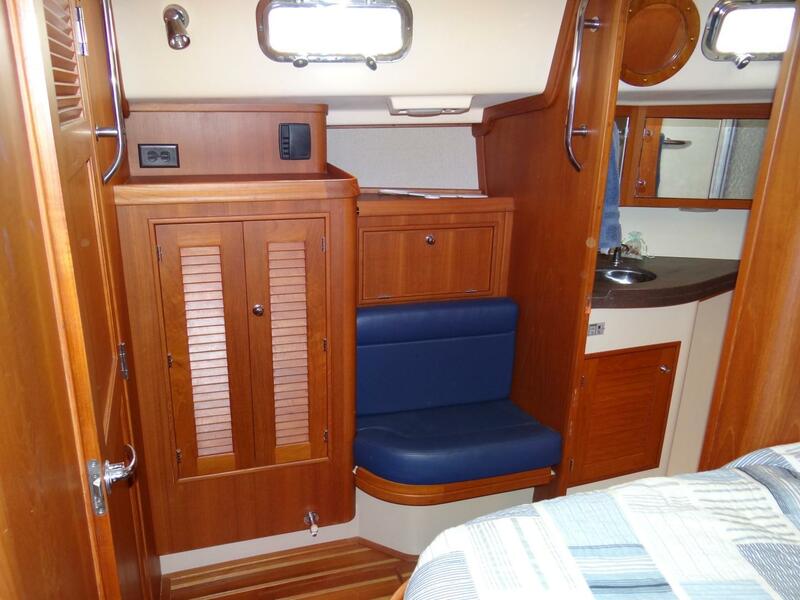 The roomy cockpit is safe and comfortable with a bimini and dodger and ergonomically designed seating. 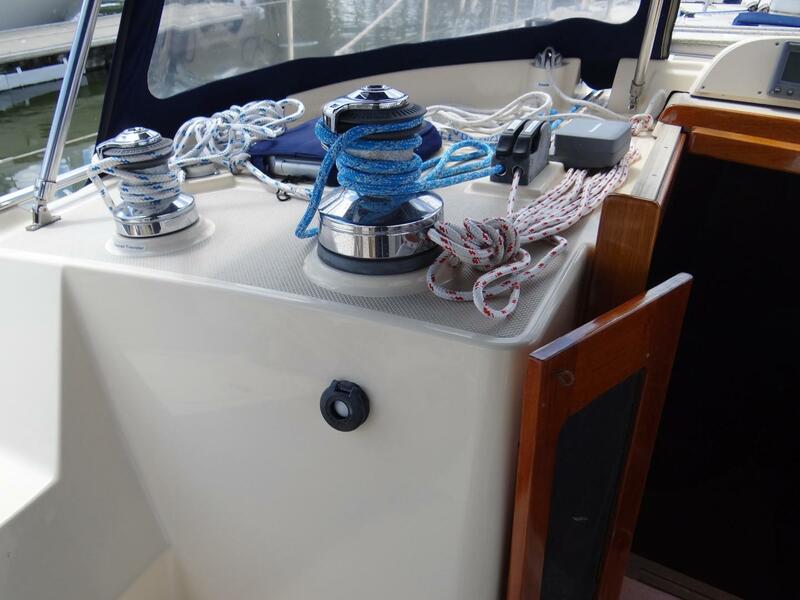 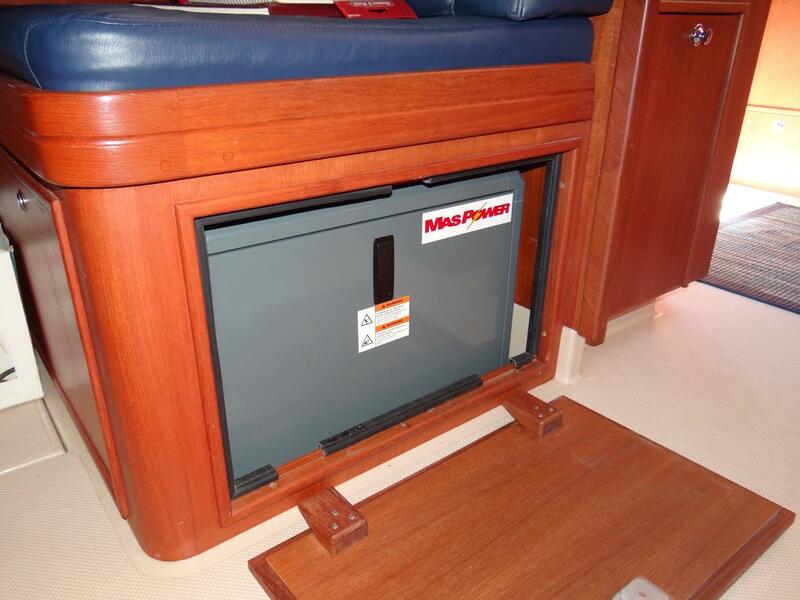 A foredeck hatch provides access to a large chain locker separated from the interior by a watertight bulkhead, while a recessed foredeck with bulwarks, uncluttered sidedecks and full length cabin top handrails provide safe footing and security on deck. 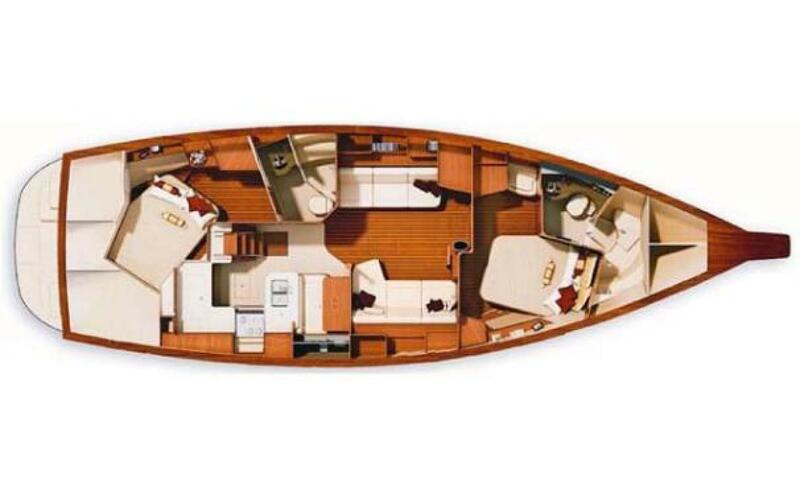 The broad transom platform with integrally molded steps makes boarding safe and simple while a concealed swim ladder makes this a gracious entryway or lounging area. 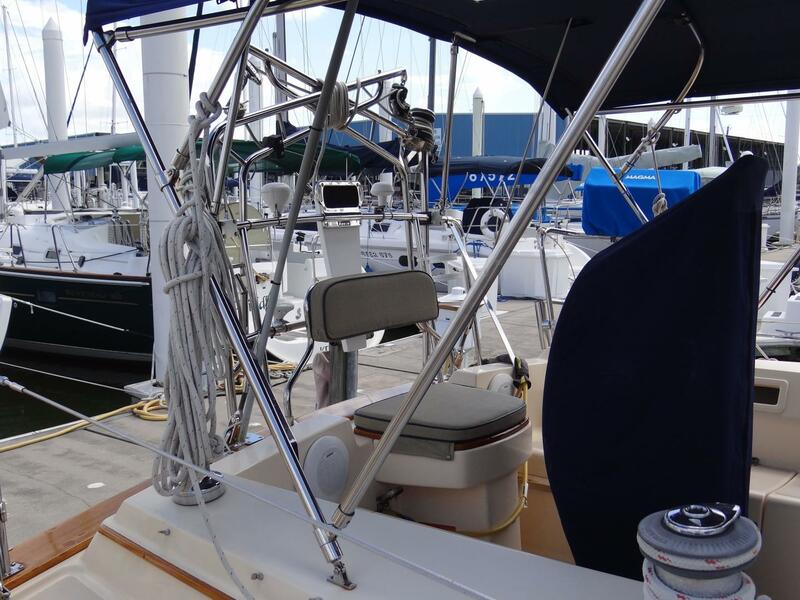 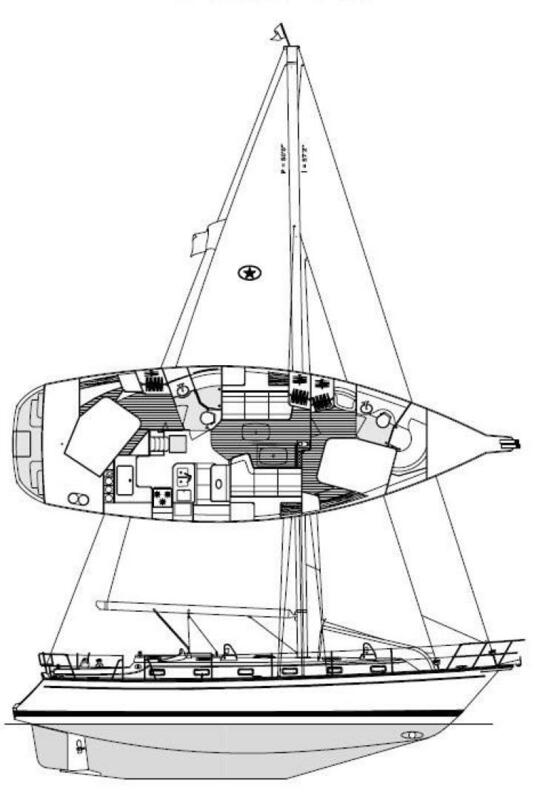 The uncluttered deck of the 440 is big enough to handle a full crew, yet the cutter rig and sail plan are completely manageable by a shorthanded crew. 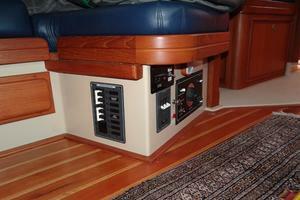 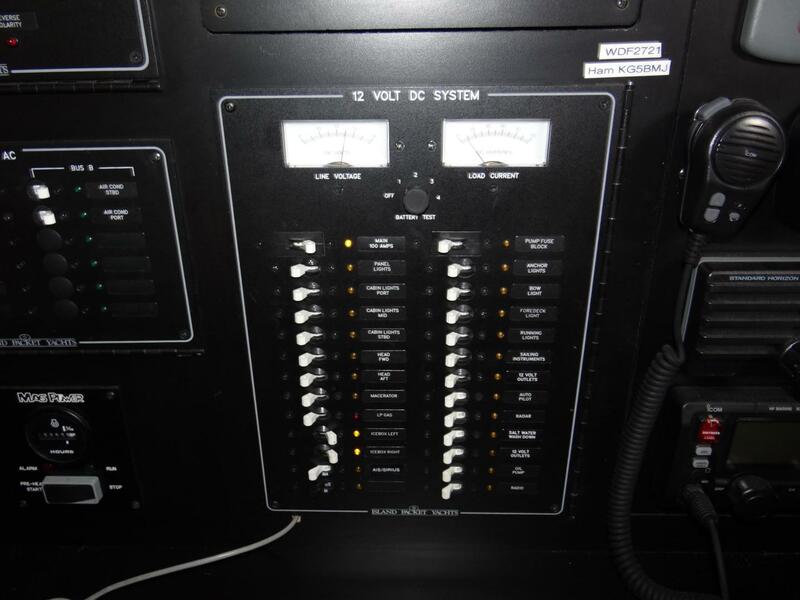 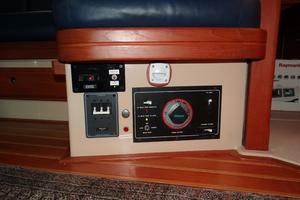 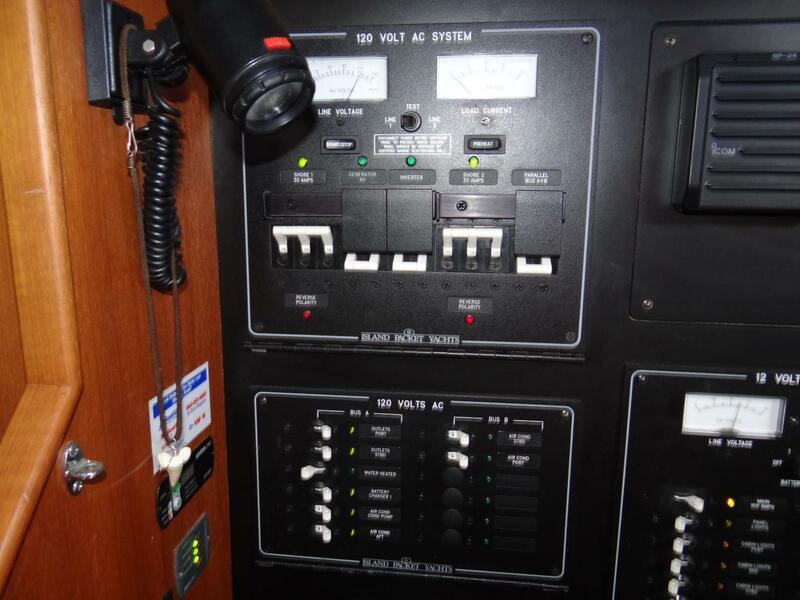 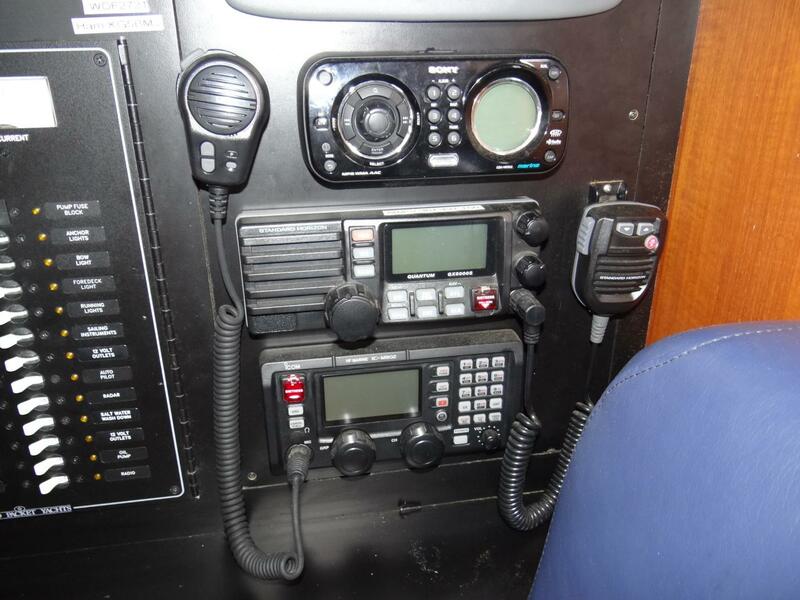 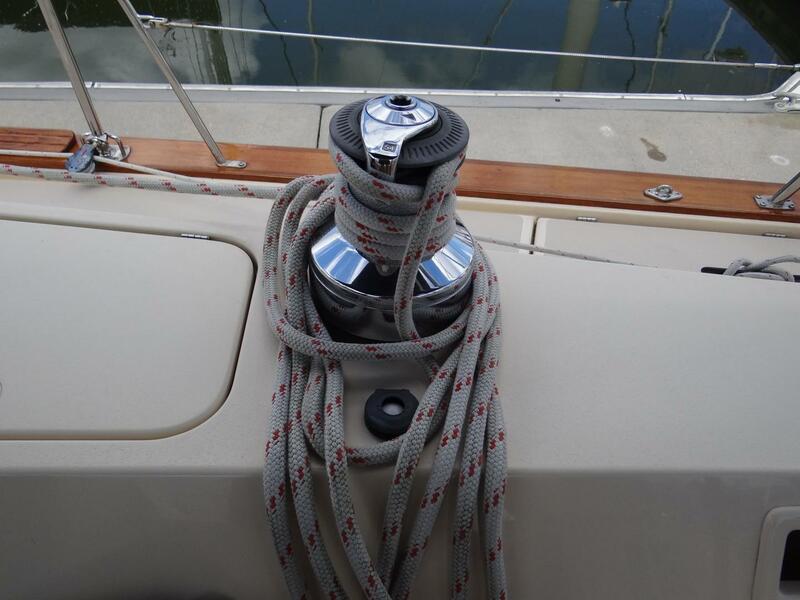 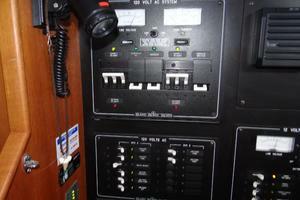 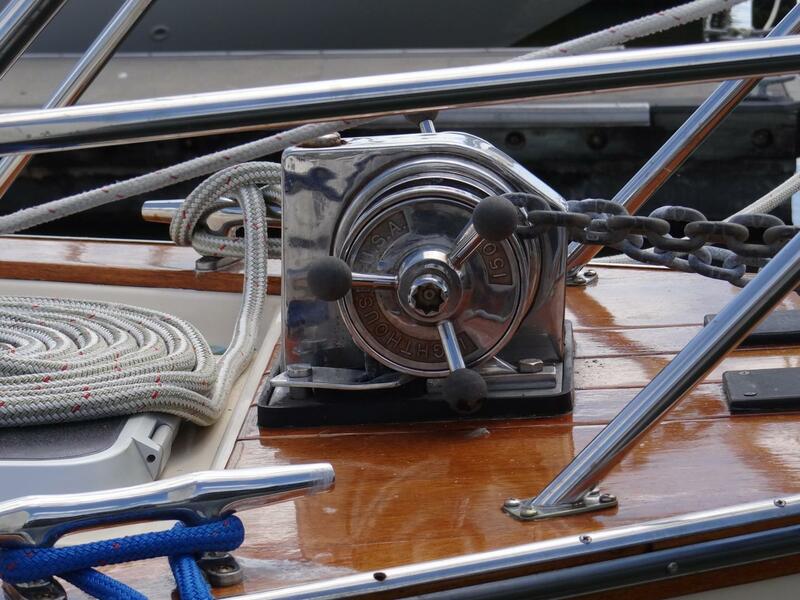 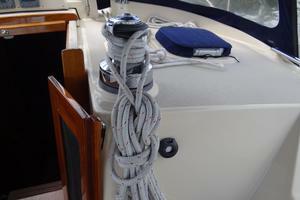 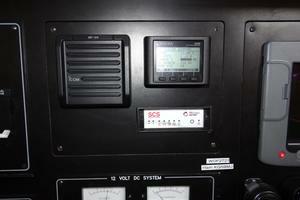 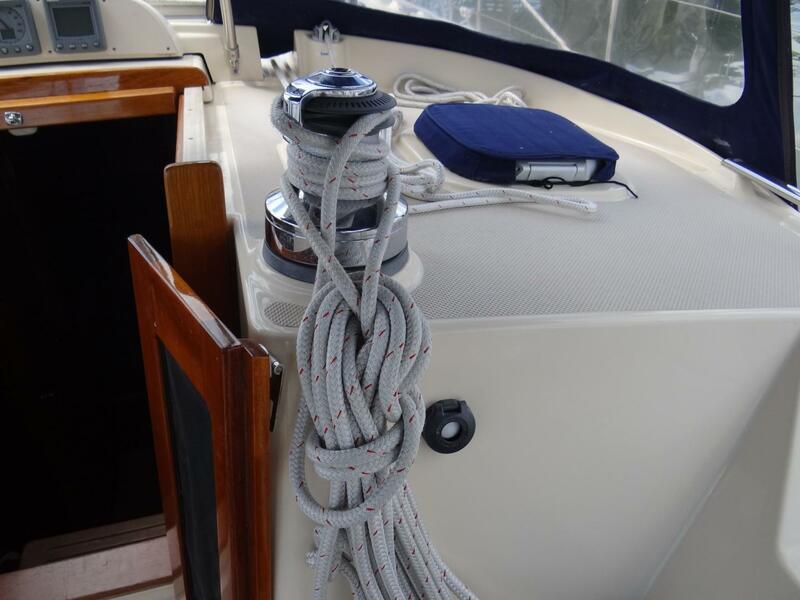 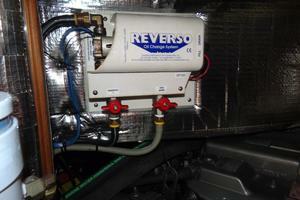 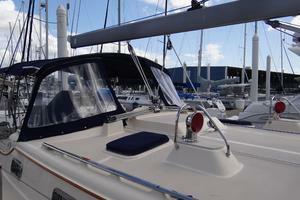 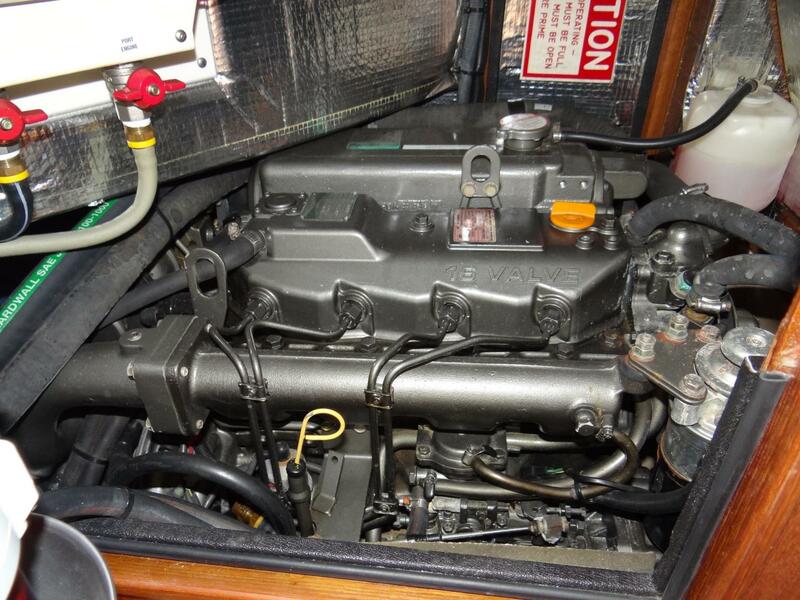 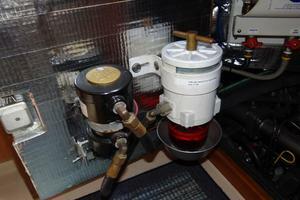 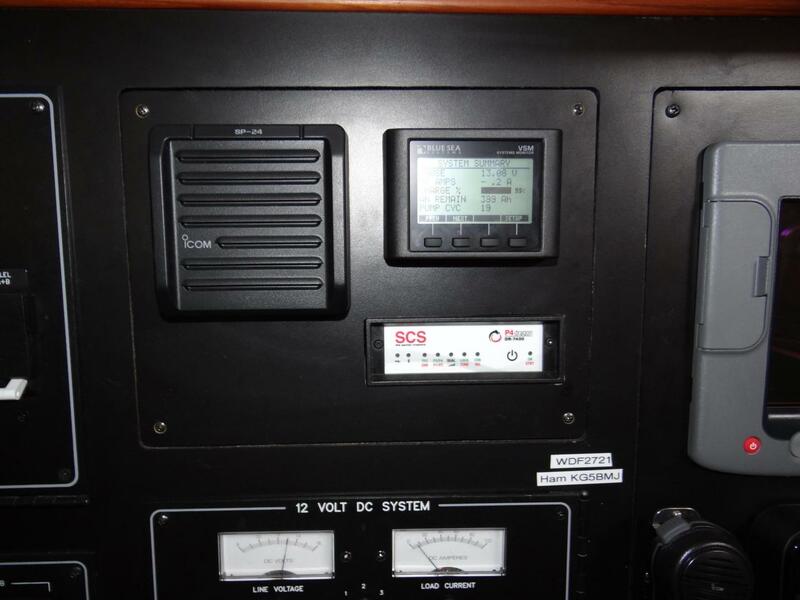 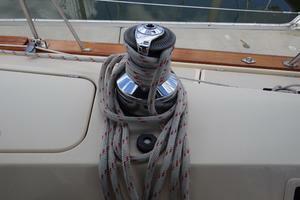 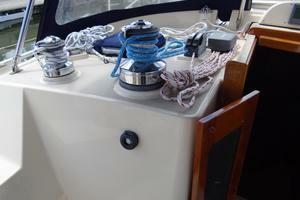 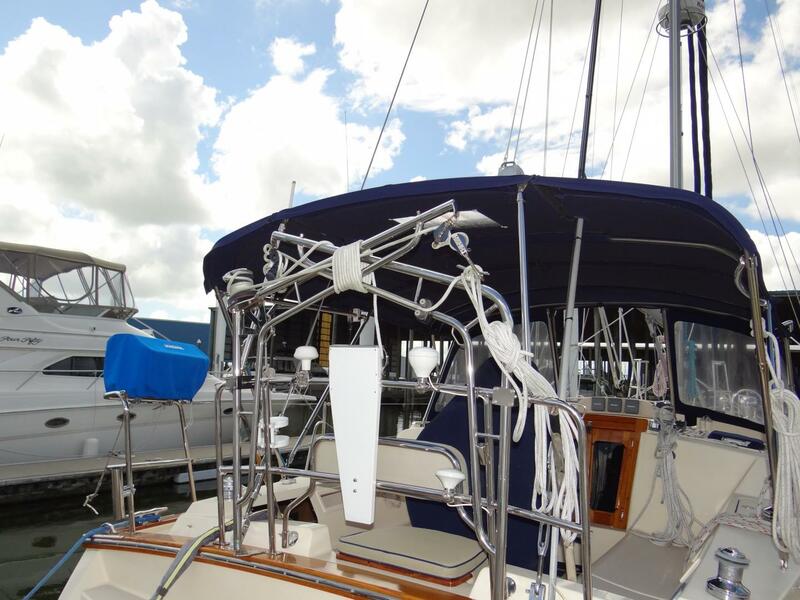 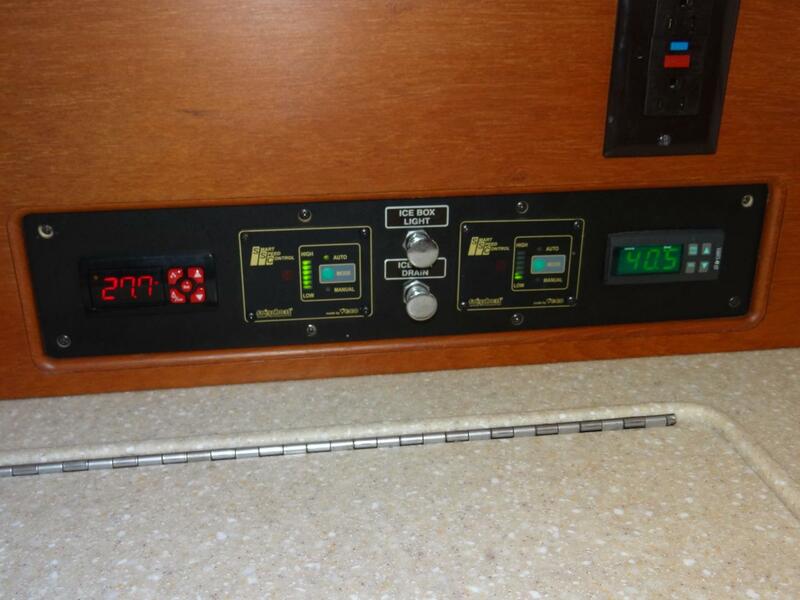 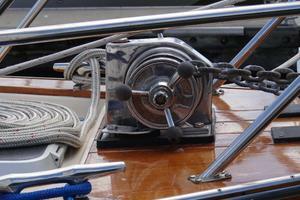 This boat is easy to handle with all of the electric winches, bow thruster, furling sails and all lines led aft. 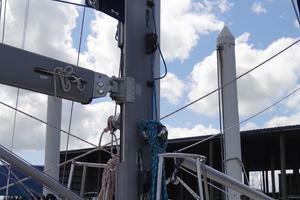 All standing rigging was replaced in June 2017. 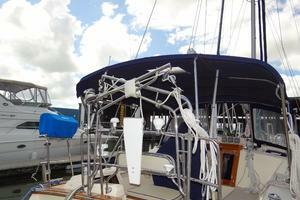 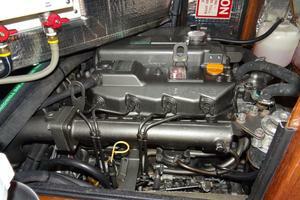 Swage fittings at deck were replaced with mechanical fittings.